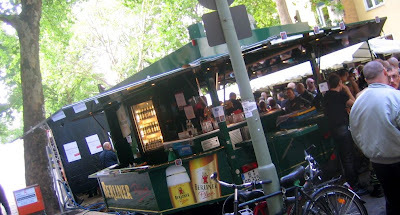 The beer trailer is an everyday sight at pretty much any American festival or event. Ours generally have taps in the side and that's all there is to it. Vendors will set up folding tables and tents around it to create a service counter for the beers served in flimsy plastic cups. Completely utilitarian and nothing more. Not so for the beer trucks in Germany (assuming that the trucks at yesterdays street fest on Fuggerstraße in Berlin are typcial). While they fold up to a small U-Haul sized trailer, it unfolds to a fairly large elaborate contraption of bars, canopies, display cases, taps, and glass washers. Yes, glass. The beer comes in large or small thin mug-like glasses. Amazing to me, at least, I don't think I've ever seen one dropped and broken (well, except by beer service guys in their rush, but not by festival goers on the street). Various tokens and tickets cover the deposit for the glasses, with the money for those returned when you turn your glass in. Just one of those small, but big differences I find fascinating about every day life over here.